Pi Day is maybe my favorite food holiday, because it involves pie (duh) and falls on a date that is meaningful rather than arbitrary. I mean, why does National Donut Day fall on the first Friday of June? Why is there another one in November? It's all very confusing. Pi Day is not confusing, and it's as easy to remember as May the 4th. Pi = 3.14 = 3/14 = March 14th. You could also use Pi to figure out the circumference or diameter of your pie. Or you could just eat it, which I recommend. This year, I decided to deviate from previous years' sweet celebrations (2015, 2016) with a savory pie. 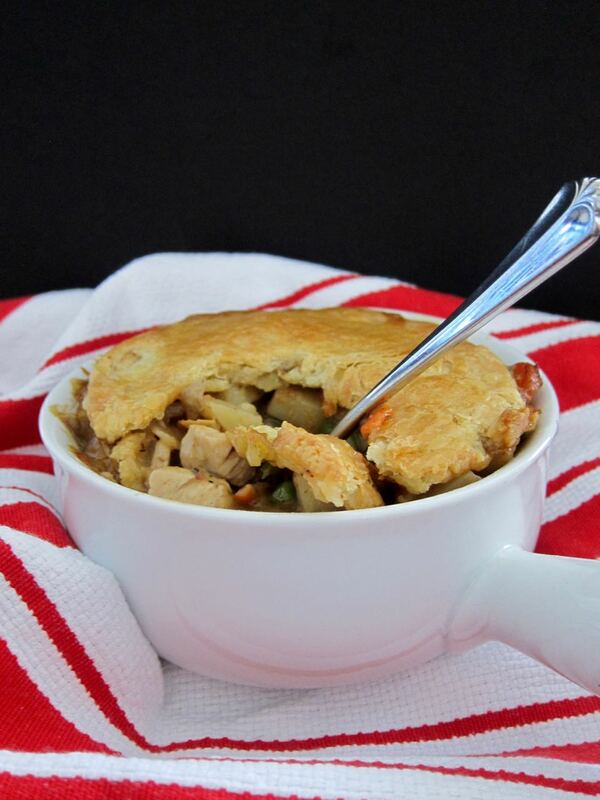 A chicken pot pie! I recently encountered some controversy on Facebook over the true meaning of a pot pie. Does it have a crust or is it just stew with a crust baked on top? I'm going to go with the opinion that a pie has a crust on the bottom and anything else is just a cobbler (except when I call it a pot pie). So, today I've got a chicken pot pie with both a top and bottom crust, though I did actually bake it in a pot-shaped dish. I'm covering all my bases here. We've got all the classics. 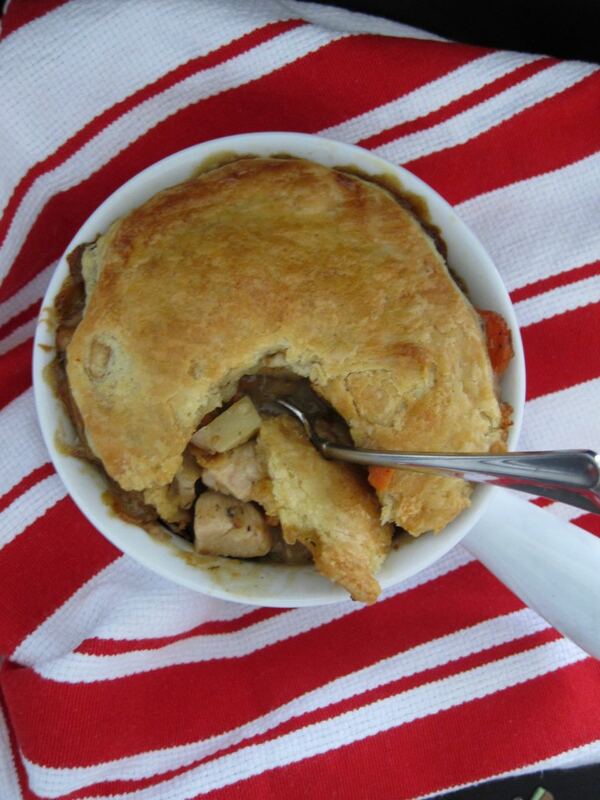 Chicken, potatoes, carrots, peas, and onion, all swimming in a thick gravy and baked into a buttery, rich crust. It's cozy, perfect, wintery heaven. You can bake it up into one giant pie, or if you don't want to consume that much chicken pot pie, do as I did and bake it up in individual pie pans so you can freeze smaller portions for later. Keep the pot pie party going into Spring, why not? Make the crust: in the bowl of a stand mixer, stir together the flour, sugar, and salt on low speed for about 10 seconds. Add the butter pieces and mix on low for 1-2 minutes, until butter clumps are about the size of pecans and the mixture holds together when you squeeze it. In a separate bowl, whisk together yolks and milk and then add to the flour mixture. Mix on low for 30 seconds, just until the dough comes together. Turn out the shaggy mass onto a counter and gather it together with your hands. Use the palm of your hand to smear the butter through the dough, sliding your hand down the sides of the mass of dough, until it all comes together in a smooth ball of dough. Wrap the ball of dough in plastic and flatten into a disc. Chill for at least 1 hour. When ready to bake crust, divide the dough into 2 pieces, one piece 2x the size of the other. Roll out the larger piece for the bottom crust to about 1/8 inch thick and cut out 4 large circles out of the dough, using your pans as a size guide. Press dough circles into the pie dishes. Chill for 30 minutes. Heat oven to 350 degrees. Line crusts with parchment and fill with pie weights. Blind bake for 30 minutes. Transfer to a wire rack, remove pie weights, and let cool completely. Make the filling: In a large pot, heat the butter until foamy over medium-high heat. Add the onion and cook for 3 minutes, until softened a little. Add a bit of salt and then add the carrot, celery, and potato. Cook another 5 minutes, then add the chicken and a little more salt and cook 3 minutes. Sprinkle the flour over the mixture and stir it in, cooking another 2 minutes. At this point, it won’t look great. Add the stock and bring to a simmer. Add the frozen peas, thyme, 1 1/2 tsp salt and the pepper, then the cream, and stir to combine well. Simmer about 5 minutes more, stirring and scraping up any browned bits on the bottom of the pan. Remove from heat and then spoon into the pre-baked pie crusts. Roll out the remaining smaller dough piece on a well-floured surface about 1/8 inch thick and cut into 4 circles again, then drape over the filled pies. Do not worry if your crust doesn’t quite cover the pie, it can be rustic. Brush the tops with a little cream and poke a hole in the middle for steam to escape. Place pies on a baking sheet to catch any overflow, and bake about 25-30 minutes, until crust is dark golden brown. Let cool on a rack for about 10-15 minutes, then serve and enjoy! You can assemble the pies fully and then freeze before baking. Wrap tightly in plastic wrap and freeze. When ready to bake, remove plastic and bake from frozen, adding 20-25 minutes to the cooking time. I adapted the original recipe to make 4 mini pot pies instead of 1 large one, using disposable mini pot pie pans I found at the grocery store. It wasn't a perfect switch, and if I do it again I'd probably increase the crust recipe a bit. If you want to make one large pie, simply roll the dough pieces into large rounds and don't cut them, and use a deep dish pie pan for baking.